Not a very neat daisy wheel is it? About 8" across, it was found during the dismantling of an upstate NY barn, c. 1790, scribed onto a board used to sheath the roof. The lines were drawn with the pin of a divider, not a marker. They can be seen in a raking light.The board is still in its proper place. This is a tracing made of the pattern carved by the pin of the divider. The barn is probably the first of 4 connecting barns, c.1790. 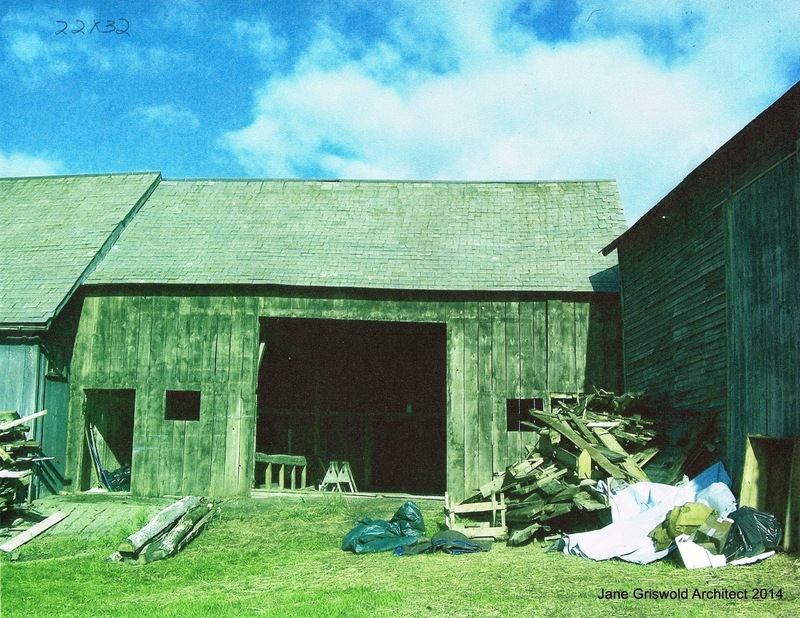 Green Mountain Timber Frames recently dismantled, repaired and sold this barn for reuse along with the barn I wrote about in December, 2014. http://www.greenmountaintimberframes.com. It has modified gunstock posts, a 5 sided ridge pole, rafters spaced 38" on center. 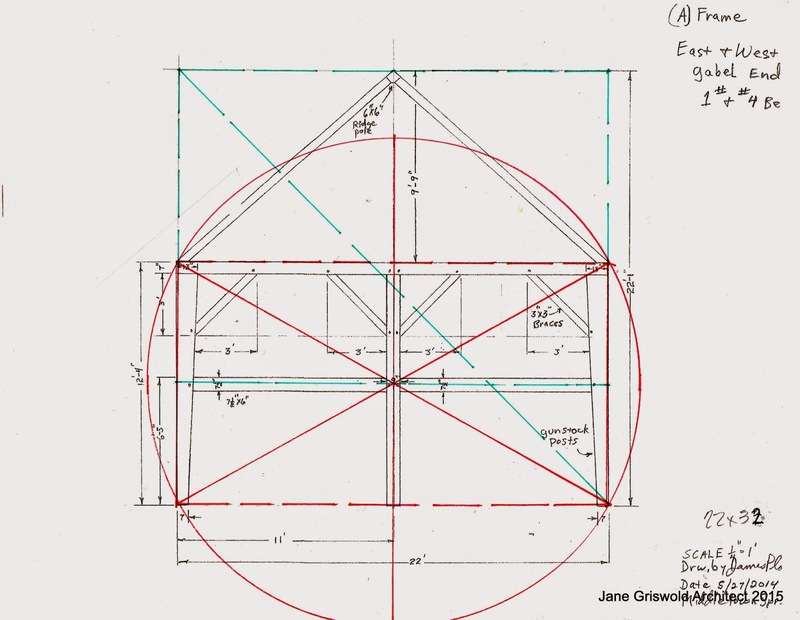 The daisy wheel determines the framing layout for this barn. The petals are not important. They are just the arcs of the radii. The tic marks around the circumference of the circle are what counts and the lines - the spokes - which connect those marks. The wooden board with the daisy wheel was the template, the reference for lengths and relationships. When it was no longer needed it became sheathing. 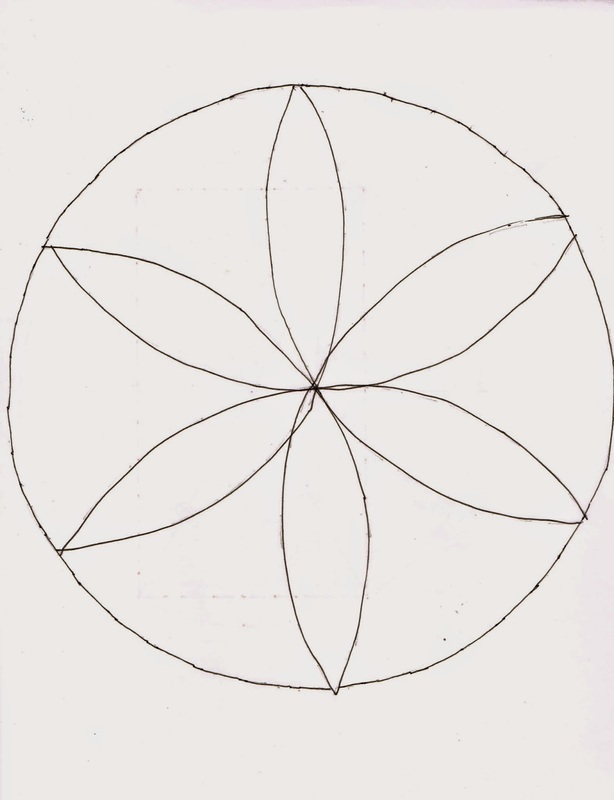 The master carpenter rotated the daisy wheel first with one diameter (2 'spokes') vertical and then with one diameter horizontal. He used all 12 points and spokes. So how did the carpenter begin? He and the farmer knew the approximate size and location of the proposed barn. He decided on a width and drew his daisy wheel. The diagrams show how to start with a length -line A-B - and create a circle whose circumference runs through those 2 points. 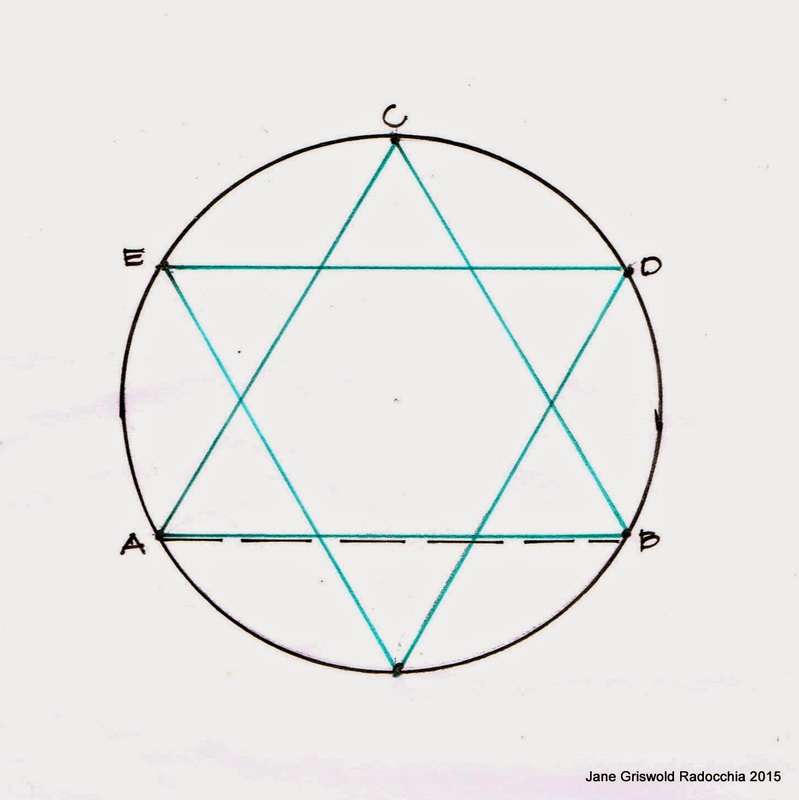 To rotate the spokes, divide the segments in half - extend the arcs - C-B-D - so that they meet . The line C - D is the rotated stoke extended. The daisy wheel rotated is drawn in black. 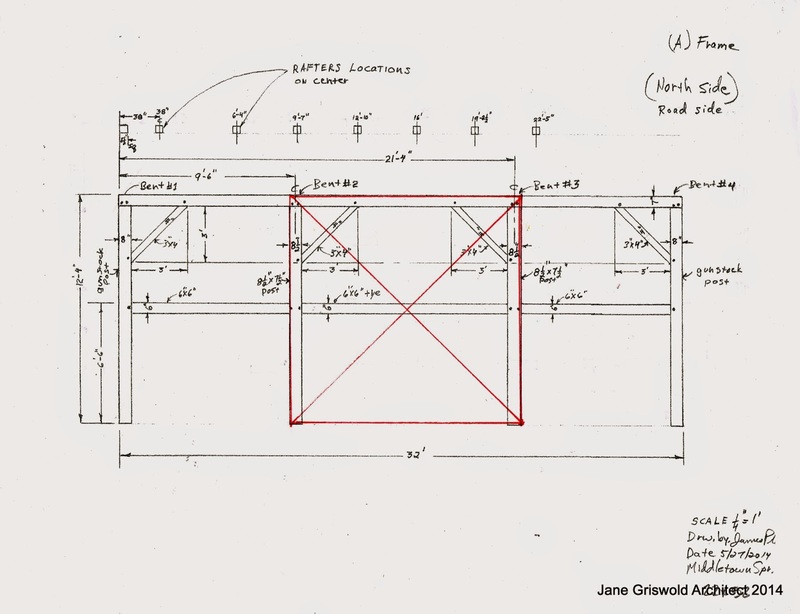 Here's the floor plan, a 22 ft. by 32 ft. rectangle that uses only one daisy wheel. The plan is outlined with double black lines. On the left end the line between 2 points on the daisy wheel is 22'-0" wide. The red spokes are the daisy wheel. The green lines connect every other spoke. Where they cross marks 32 '-0" in length. Here is how he could have laid it out on the barn floor. A-B is the width of the barn. Use that width as a radius to draw 2 arcs. They meet at C. The green lines which connect A,B. and C make one half of the 6 pointed star. Then he could swing arcs from each point. 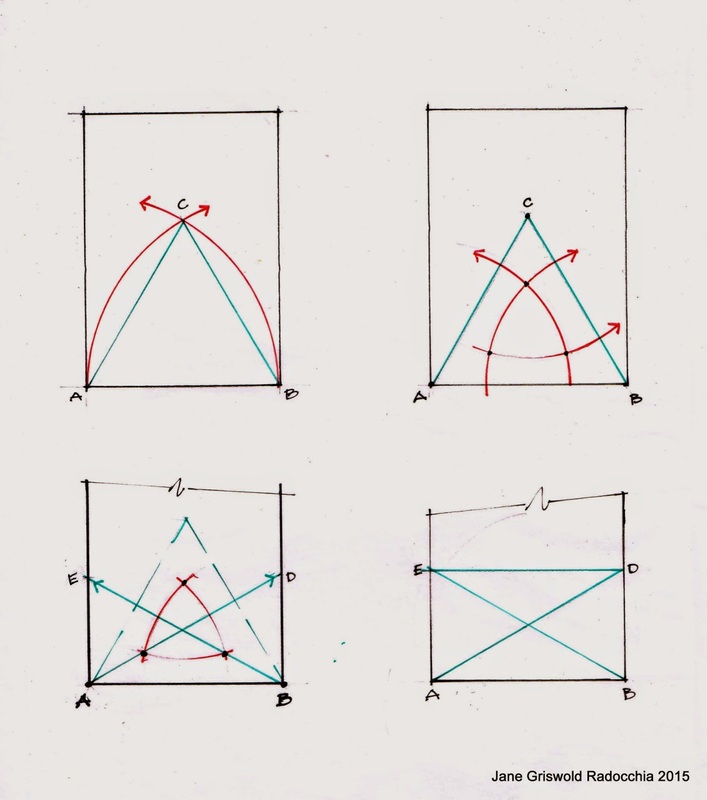 The intersections of the arcs gave him second points so he could draw straight lines A-D and B-E. They cross in the middle of the triangle which is the middle of the 6 pointed star, the daisy wheel. A-B-D-E is the size of the barn's end and interior bents. 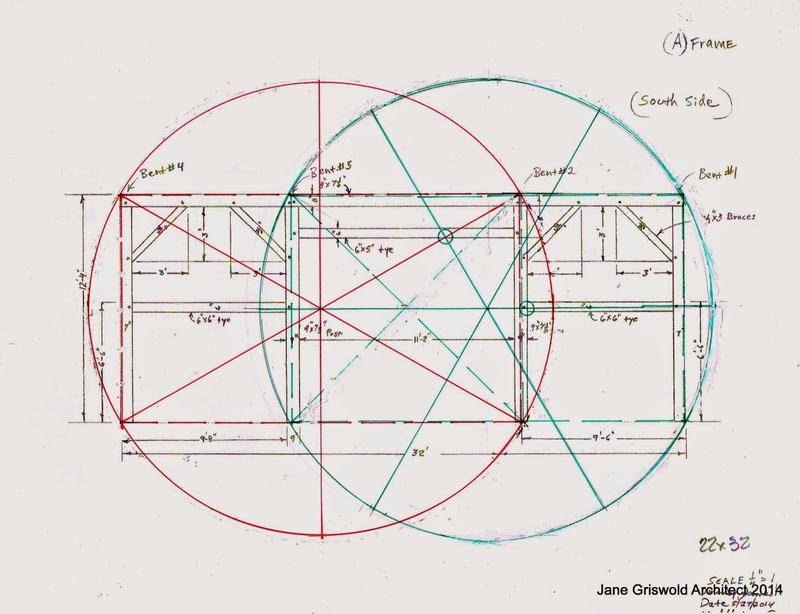 Below is the layout of the interior bents: first the daisy wheel with vertical axis defining the rectangle - dashed red line; then the daisy wheel rotated, the rectangle defined again - dashed green lines - and the location of the cross girts located - see the green circles. 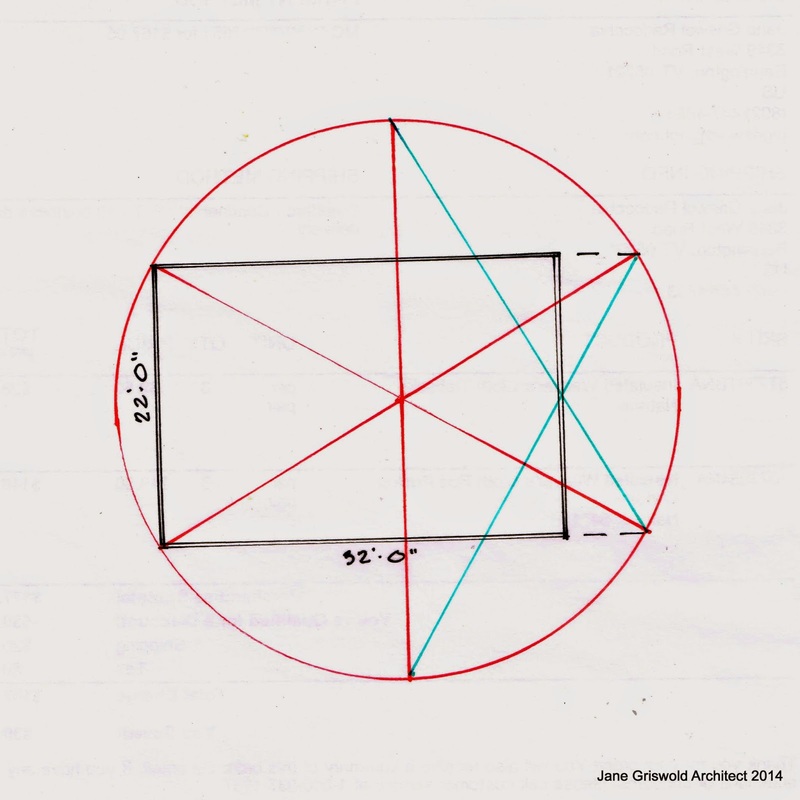 The gable ends of the barn fit neatly into the daisy wheel geometry. 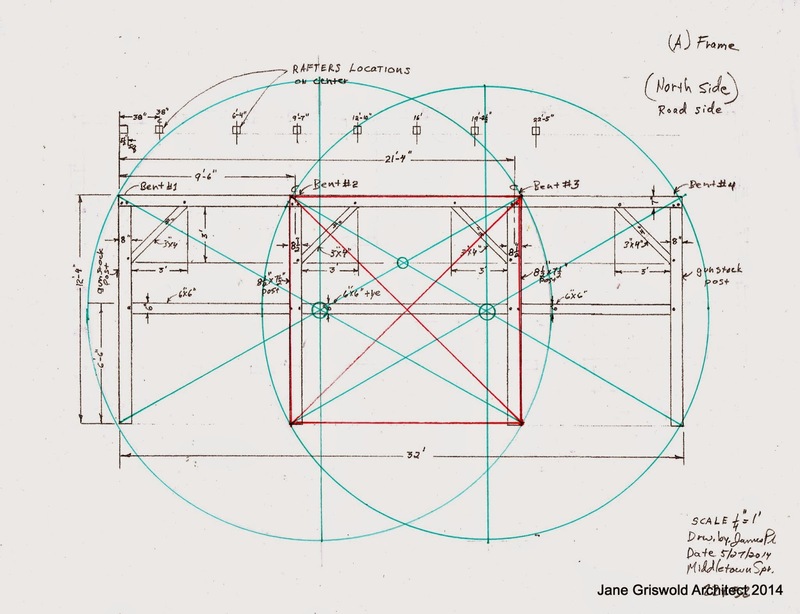 The rectangle is defined by the 'vertical' wheel, and the cross girt location by the center of the wheel - horizontal dashed green line . The gable's ridge is 22' high. 22' is also the width of the bent, the side of the square which enclosed the gable end - square laid out in green dashed lines with diagonal. The 32 ft east and west walls may have began with the center bay. It laid out the door and the center aisle. The farmer and the framer must have had a good idea how large that door needed to be. A square centered on the wall would have been simple to lay out. 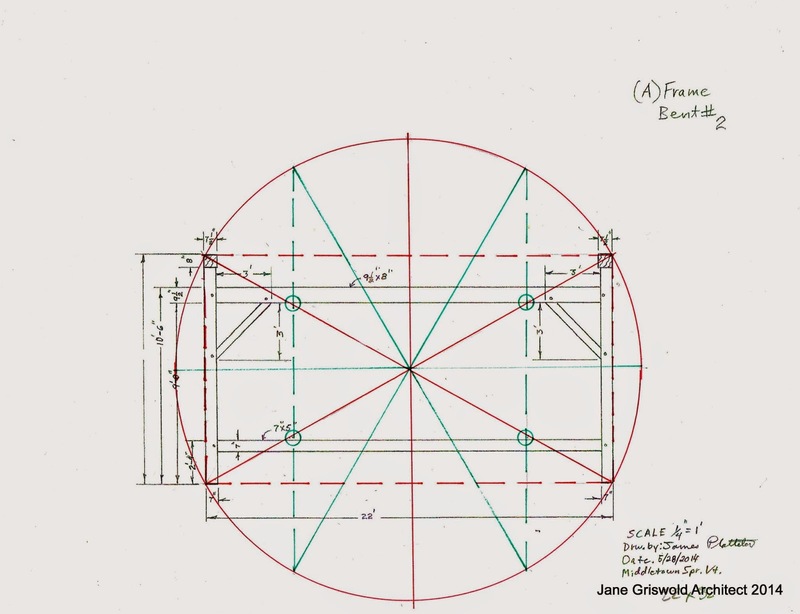 Each side was laid out with girts similar to the end walls and the 2 bents.The red dotted line connects the 4 points of the daisy wheel to make a rectangle. 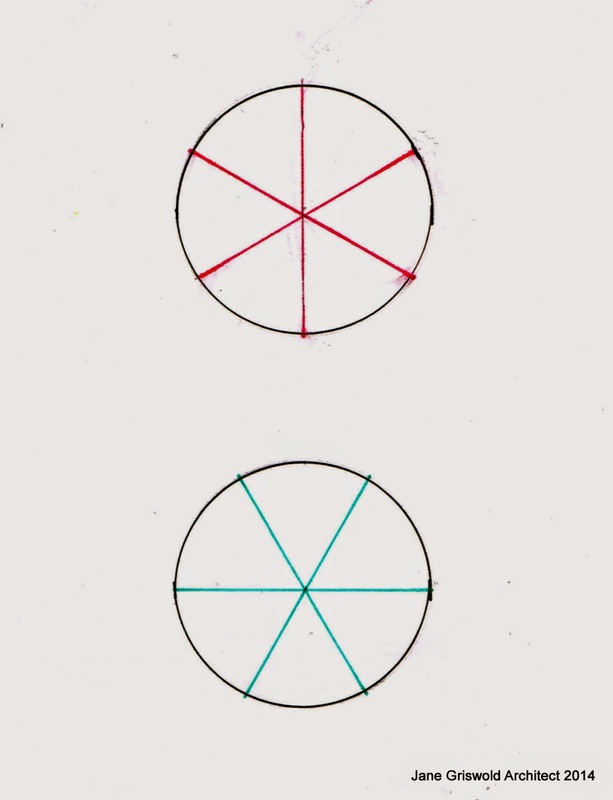 To make the daisy wheel application on each side of the central square clearer I have drawn the center square in red, and added green circles at the centers of the daisy wheels. I also added a small green circle where the diagonals of the daisy wheels cross to mark the height of the braces. 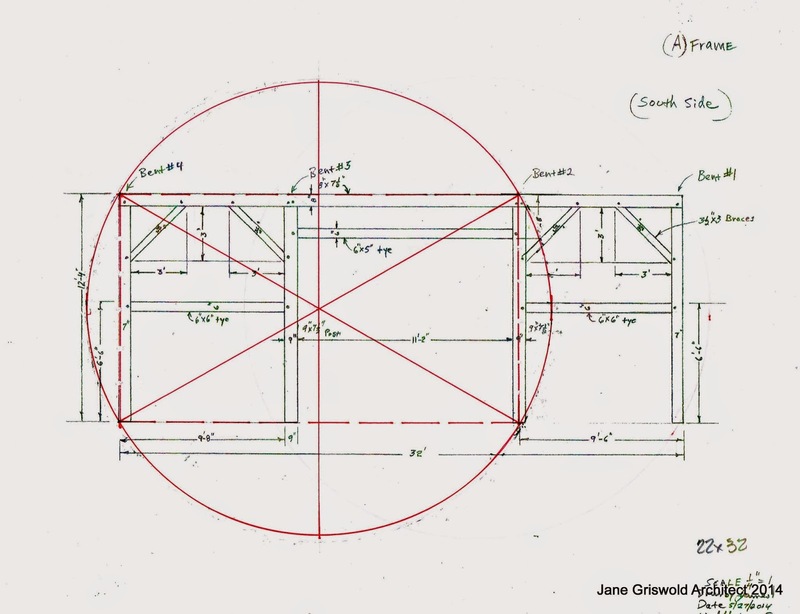 The cross girt - the header above the barn door - is placed on the intersection of the diagonals of the 2 daisy wheels. Here one daisy wheel is drawn in red; the other, rotated, is in green. A small green circle marks the intersection. 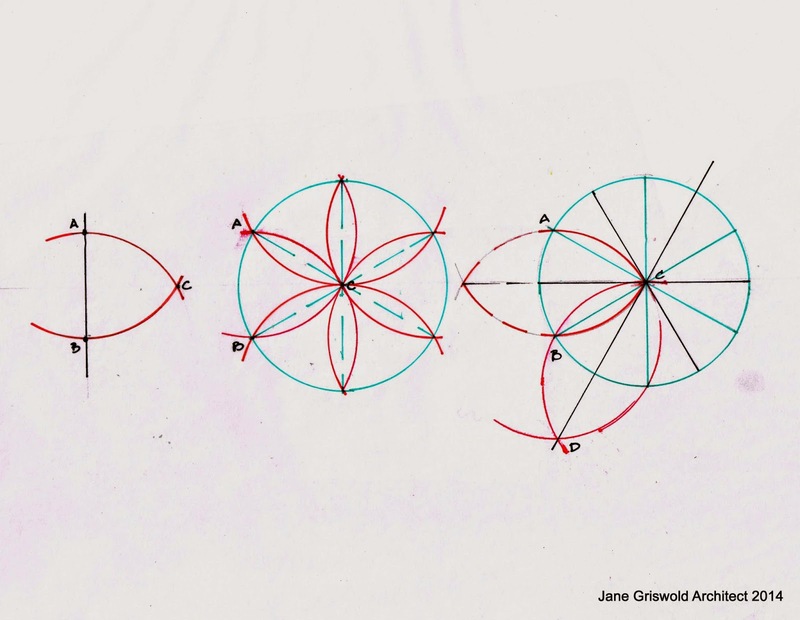 I have rewritten this post 4 times as I see simpler ways to design with a daisy wheel. So far, the diameter of the wheel found on the sheathing - 8.1" - does not seem to be germane to the layout. It is a marker, a guide. 8"+8"= 16". 16" stepped out 3 times is 48", or 4 feet. The barn is 32 ft long. 8.1" stepped out 6 times would be 4.6 ft. 8 x 4.6 ft. = 36.8 ft.
5 x 4.6 ft = 23 ft. The barn width is 22 ft. I need to borrow Dr.Who's Tardis. I want to talk to this framer.